This one is fun and easy for the kids! 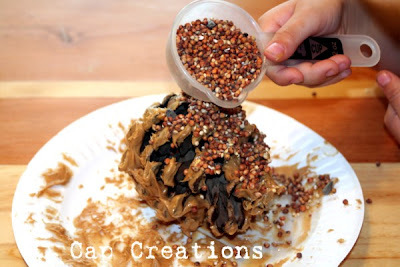 Cover a pine cone with peanut butter. 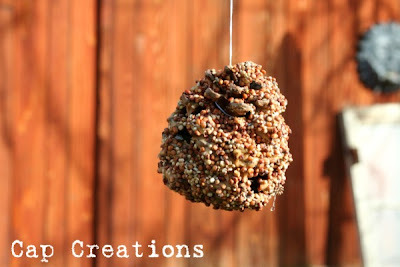 Pour on some bird seed. Tie on a string and hang. So good even poor Sally Dog wanted it! lol! She kept pacing, sniffing and sniffing trying to figure our where that yummy peanut butter smell was coming from. 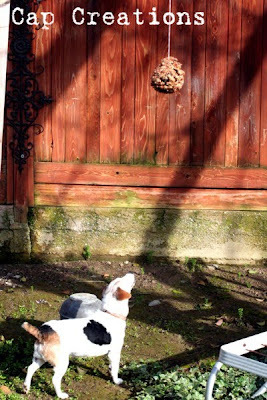 Look up Sally! "Oh I found it!" I'm stopping by from Friday Follow!! I'm your newest follower. I can't wait to start reading your posts! That's always a fun projects for the children! I love how the dog is looking up at it like he wishes he could jump that high! LoL. 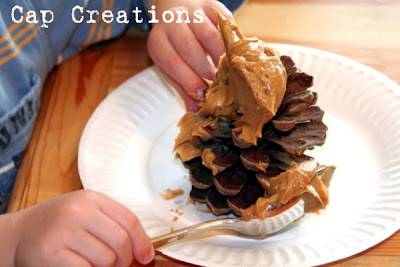 We saw this craft on Special Agent Osso and have been wanting to do it as soon as I can find some of those big pine cones. I friend did suggest that she used empty toilet paper rolls and that her daughter had an easier time with spreading the peanut butter. I guess it wouldn't last as long, but we might try it.